St. Mochaemhog was a holy man from Leigh, in the modern parish of Two-Mile-Borris, Co. Tipperary. In the year 550 he travelled, with a group of his monks, to a place he described as ‘Enachtruim, which is in the Slieve Bloom, in the territory of the Leixians’. The site was close to where the Tonet and Delour rivers joined the Nore. At the time, the Nore represented the northern boundary of the Kingdom of Ossory and as the new settlement was on the north bank of the river it was always referred to as being in the territory of Leix. Mochaemhog developed the site into a serene and peaceful community of prayer and reflection. One day, some years after his arrival in Anatrim, a man called Bronach came and told Mochaemhog not to ‘labour in vain, because this place will not be yours’. The man then tried to force Mochaemhog out of the monastery by force. Taken aback by the stranger’s audacity, Mochaemhog said that Bronach had an appropriate name (Brón being the Irish for sadness) as the chieftain of the area would expel him for what he had done. Mochaemhog also prophesised that he would stay in Anatrim until such time that a holy man called Coemhan (Kavan) would arrive there. Mochaemhog’s prophecy came through shortly afterwards when Kavan arrived to Anatrim out of the blue. Mochaemhog returned to Munster whilst Kavan lived in Anatrim for the rest of his life. Rev. William Carrigan, The History and Antiquities of the Diocese of Ossory, Vol. 2 (Dublin, 1905), pp 146-150 and Rev. John Canon O’Hanlon and Rev. Edward O’Leary, History of the Queen’s County, Vol. 1, (Kilkenny, 1981), p. 296. The old Anatrim church and adjoining graveyard which is the final resting place for hundreds of Catholics and Protestants alike. Kavan was a member of an extraordinary holy family. His brother was St. Kevin, who established the monastery in Glendalough, Wicklow. There were a further six saints in his immediate family. Kavan received his religious training in the monastery of Terryglass and his feast date is 3 November. He died around the year 600 AD. The monks of Kavan remained in Anatrim until the 12th Century when they seemed to have died out or moved elsewhere. In the early 13th Century, William Fitzjohn, the Bishop of Ossory, appropriated the parish of Offerlane for the Abbey of Duiske and they held possession of Anatrim until 1540. Some of the monks of Duiske, from Graiguenamanagh, Kilkenny, built a new chapel on the grounds of the monastery in 1510. In 1700 a Protestant church was built over the 16th Century Catholic chapel. All that remained of the earlier structure was a stone roofed chamber adjoining the Protestant church on the north side. This was the sacristy of the original church and it was converted into a mausoleum by the Sharpes of Roundwood and the Floods of Middlemount in the 18th Century. The conversion process destroyed many of the remnants of the old structure including a stone stairwell and a second floor which was probably a residence for the abbot of the monastery. The 18th Century Protestant church began to fall into disrepair in the 1830s and was eventually condemned in 1837 when the modern church was built further up the road. 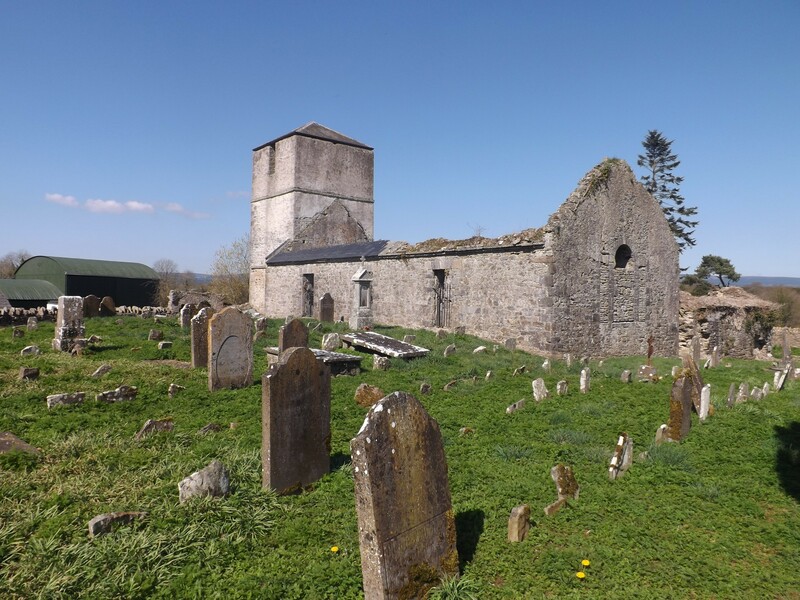 In Samuel Lewis’ Topographical Dictionary of Ireland there was a mention of the disrepair of the old church and the erection of the new church which was being paid for by subscription and by a grant from the Ecclesiastical Commissioners. Laois around the famine times : A description of the parishes, towns, and villages of County Laois, as found in "A topographical dictionary of Ireland" by Samuel Lewis with an introduction by John Goulding (Dublin, 2000), p. 86. 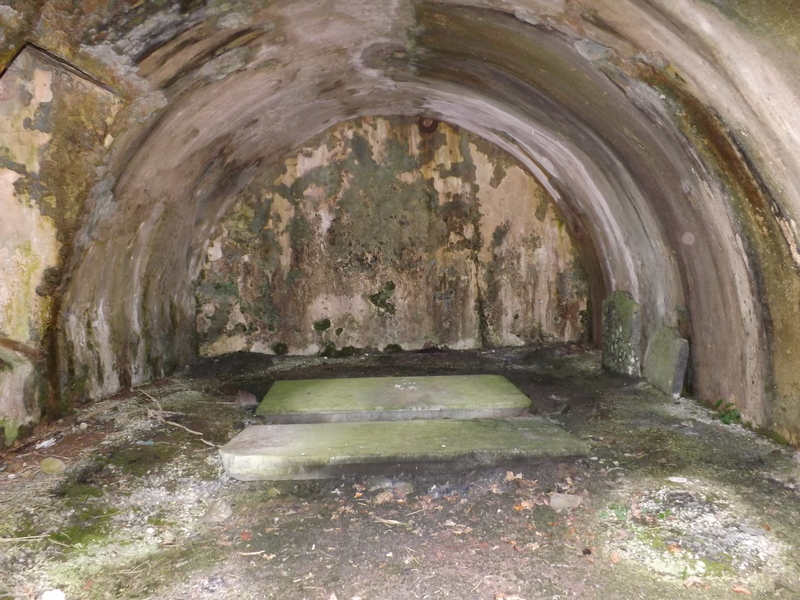 The Anatrim Mausoleum with four graves within. Gravestone in Anatrim Mausoleum alluding to a terrible tragedy for the Flood family. 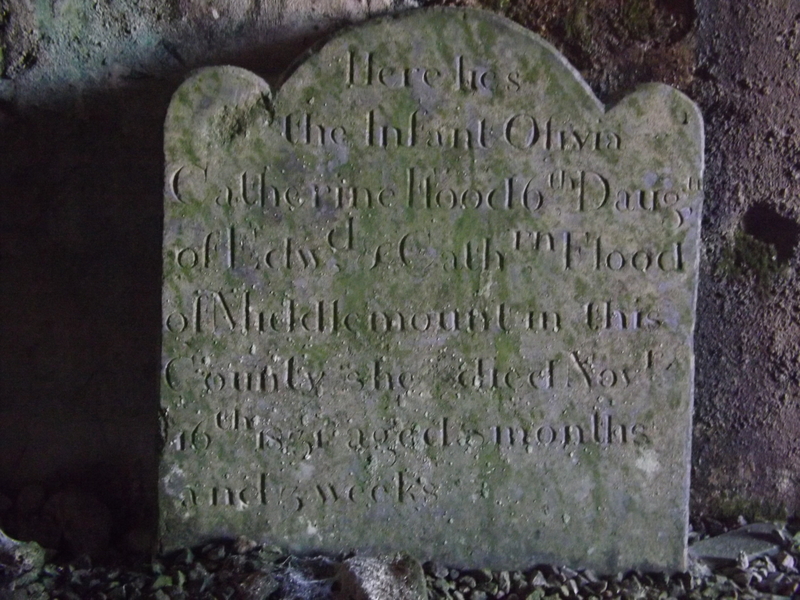 The gravestone reads ‘Here lies the infant Olivia Catherine Flood, 6th daughter of Edward and Catherine Flood of Middlemount in this County. She died November 16th 1831 aged 8 months and 3 weeks ’ Directly beside this grave stone is another where a second infant is buried. St. Kavan’s well was a site of veneration up until the 1830s. A pattern was held there every 3 November for generations. The well is covered by a large stone known as St. Kavan’s stone. There were also two other wells attributed to Kavan; one in Whitefields and one in Derrynaseera, both of which had been closed up by the early 20th Century.